Dhokar dalna is one of the oldest recipe of Bengali cuisine. This is a vegetarian dish very much popular to the Bengali. This is kind a fried lentil cake, dipped in thick tomato ginger based gravy. In Bengali cuisine, onion & garlic are strictly not allowed in vegetarian dishes. So tomato and ginger plays the main role here, and tempered with whole garam masala, and lastly ghee & garam masala paste added to enhance the aroma. The finishing touch of this kind of recipes are called 'Santal Dewa', means tempering. I know, tempering should be at the start of any dish, but in Bengali cuisine, it comes at the end. So the aroma or tempering lasts till it is consumed. Dhokar Dalna is one of the oldest recipes of Bengali cuisine. This is a vegetarian dish very much popular to the Bengali. 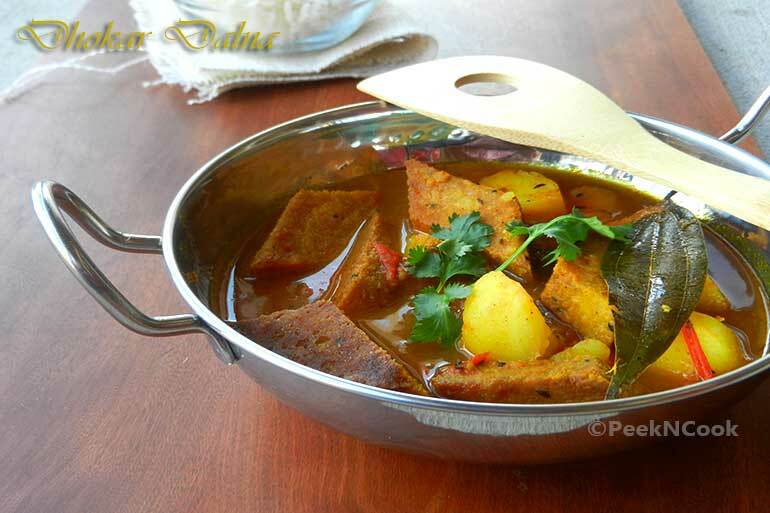 Learn how to make Dhokar Dalna step by step on PeekNCook. Find all ingredients and method to cook Dhokar Dalna along with preparation & cooking time. Wash both the dal & soak the dal together overnight. In the morning, discard the excess soaking water from the dal. Take a blender, add both the dal and ginger, and make a smooth and thick paste of dal with minimum water. In the meantime dry roast the cumin seeds, coriander seeds & red chili in a pan and make a coarse powder. This is called Bhaja Moshla. Now take the dal paste in a large bowl, add salt, sugar, the Bhaja Moshla & turmeric powder and mix well using a hand blender. If hand blender is not available at home, use your clean hand and beat well for 2 minutes. Take a wide pan or kadai and heat 2 tablespoons of mustard oil. Now take the paste and fry in oil at low flame for a minimum of 10 minutes from all sides. Keep stirring while frying. Fry this until the paste comes together and sticky. Now take a plate and grease it. Take the paste and pour it on the plate. While it is warm, pat the paste with your palm and form a flat, 1" thick structure. Let it cool down completely. Once it completely cools down, take a knife and cut the paste in small diamond shape. Take a flat pan with high edges, heat enough mustard oil and add 5 to 6 diamond shaped cakes into the pan and fry till golden brown in color. Fry rest of the cakes and put on a paper towel. Fry the potatoes in the same oil and keep aside too. Now make a smooth paste with tomato & ginger in a blender. It will be better if you can use 1 tablespoon fo ginger paste. If you are using tomato ginger paste, then heat 2 tablespoons mustard oil in the same pan and add this paste to the pan. Keep stirring till the raw smell of tomato goes off. In the meantime, take a bowl, add turmeric, cumin & red chili powder in it and add 2 tablespoons of water and make a smooth paste. Add this paste to the pan and keep stirring everything. Add salt and sugar to it and keep stirring till oil separated from the masala. Add fried potatoes to the pan and add 2 cups of warm water. Cover the pan and simmer the gas & let the potatoes cook till soften. While the potatoes are soft enough turn off the gas. Now pour the curry in a bowl. Heat 1 tablespoon ghee, temper the ghee with cumin seeds & bay leaf. When nice aroma comes from the bay leaf & cumin seeds, pour the curry along with fried Dhoka & potatoes to the pan and boil for 2 minutes. Sprinkle garam masala powder and cover it till serving. If you're using ginger paste, the first add chopped tomatoes to the oil, little salt on it and cover the pan simmer the gas till the tomatoes are got mashed. In the meantime take a bowl, add ginger paste, turmeric, cumin & red chili powder in it and add 2 tablespoons of water and make a smooth paste. Add this paste to the pan and keep stirring everything. Rest is same. Serve with steamed rice or phulka.